Looking to give your property a durable driveway, Walkway, or a patio? If you’re reading this article, you’re probably already on the right track. 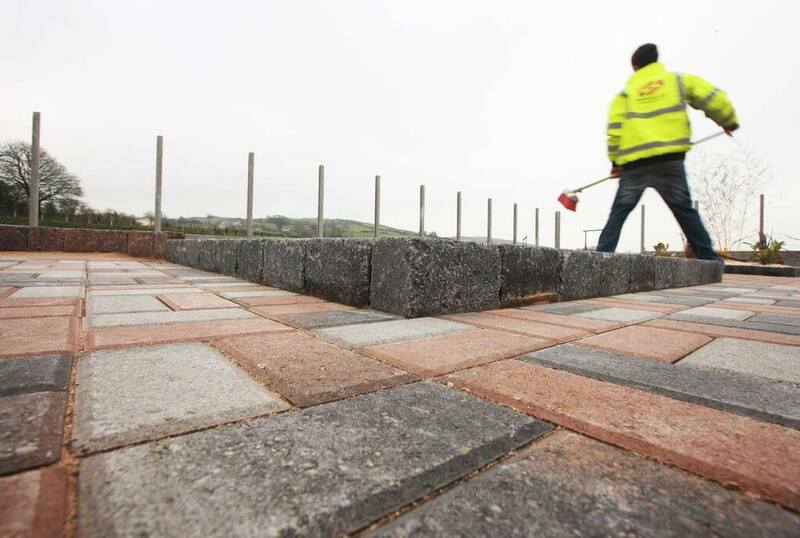 Concrete or brick paving Blocks can help any yard look its best. They’re versatile, long-lasting, and you can customise your design to be as dramatic or as low-key as you want. Installing paving correctly requires planning, and elbow grease, but you can do it and save yourself some money in the process. A good plan is essential to a successful paving project. Think about where you want your path, driveway, or patio, and then use graph paper to make a scaled drawing of the immediate area in your paving project. You’ll have to play around with your design a bit, so be sure to use pencil and keep your drawing neat. Your project will need to have adequate drainage if you want it to be safe and durable. You’ll also want to make sure that it slopes away from your house and other structures. To ensure adequate drainage, you should have a slope facing away from the buildings and in direction of the normal drainage. You have a lot of choices in the paving you use. Most are brick or concrete, but you can find a variety of sizes, shapes, and colors. Find a style that is to your liking and that fits your budget either online or at your local builders supply shop.In general, if your project area isn’t too irregularly shaped, you can safely calculate how much paving you need by simply measuring the square metres of the footprint and adding 5%. If your design has a lot of curves, get an extra 10% over your best square metres estimate.You should order a bit extra because you’ll almost certainly end up having to cut some of the paving to get the right fit. The fancier your outline, the more paving you’ll have to cut. Use string or garden hose to outline your project. Drive stakes to hold the outline in place and use a triangle to make clean corners. Step 4 - Scope your slope. To avoid water pooling on your paving, you want your paving to be slightly above the surface of the surrounding ground at all points. When planning the slope, begin with what will be the highest point. Typically, this is the point at the bottom of the front door or otherwise closest to the house. Drive a stake at the high point, and mark the correct height where the paving will meet the door or structure. Tie a string around the stake at that height.Drive a stake (if there isn’t already one) at the outer boundary of your project. This will be your lowest point. Attach a line level to your string and then tie the loose end of the string around the outer stake at the height at which the line level tells you the entire string is level. Now from that line move down the stake at least 1/8″ per linear foot (e.g. if it is 8 feet from your front door to the outer edge of your patio, move down the stake 1″), and draw a new line. Move your string down to this line. String cross-lines down the length of the project to ensure you mark the correct depth across the entire project. If your project area has a variety of slopes, or if your design is irregular, you’ll need to repeat this process in several points. It is absolutely critical that you get the slope right, so the more stakes, the better. Spaces which will be exposed only to foot traffic generally need 4-6″ of base material, while driveways or projects in very wet soil may need more of base. Figure out how deep your base will need to be (consult the manufacturer or your building suppliers merchants), and add about 1-1.5″ for the sand layer, plus the thickness of the paving (this varies by brand and style but is typically 50mm or 60mm). The sum of the depth of the base, the sand, and the paving will be how deep you need to excavate your project area. Be sure to excavate 6-12″ beyond the boundaries of the project to give you enough space to install your edge restraints.Measure the depth of your excavation from the string you used to track your slope, not from the surface of the ground. Base material is usually coarse, crushed stone with sharp irregular edges. The two most important things about base material is that it remains strong when compacted (to serve as a base for your paving) and that it drains properly. Poor structural integrity and poor drainage can ruin an otherwise perfect paving project. Add no more than 6 inches at a time to the entire excavated area, and then compact with a hand tamper (for very small projects) or a mechanical plate compactor. It’s essential that the base be well-compacted. Repeat this process until you have a base of the correct depth. Now is your last chance to properly adjust the height of the finished project and to ensure you don’t have any dips or bumps. Slightly increase or decrease the thickness of the base as necessary, taking frequent measurements from your strings to the base.Be sure to lay base material beyond the planned boundaries of the paving. Laying the base outside the boundaries of the paving will make your project more stable.Continue adding base material and then compacting every 2 inches until you are about 3 inches from your desired finish height. When compacting, be sure to maintain a gentle slope – usually away from your house. Edge restraints will help hold the shape of your project over the years. Place these restraints, usually made of plastic, aluminum, or steel, around the perimeter of the project and secure them into the ground with 12″ spikes. If your design is irregularly shaped, you’ll need to cut the restraints in order to follow the edges of your design. The sand is the material that holds your paving in place. Use coarse sand and screed it smooth to a uniform depth of at least 1 inch, but no more that 1 1/2 inches. If your project is large, lay down 1″ screed pipes and then pour the sand in between the pipes, screeding the sand in small sections (50-100 square feet each). Remove the pipes and then fill in the gaps with more sand. Luckily, laying paving is easy compared to all the work you’ve just done. Begin laying paving at a 90-degree corner, preferably one that abuts the house or another structure, and continue extending the paving along the longest straight side. 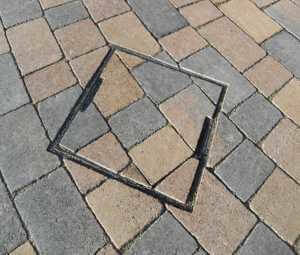 Work out from there, keeping your paving in straight lines. Lay paving by placing them straight down in the sand –do not slide them along the ground or kick them into place and disturb the sand. Slide each paving straight down the edge of the adjacent paving. Don’t worry about gaps: you generally want to leave a 1/16″ to 1/8″ gap between paving. Periodically check to make sure the paving are flat, using a string to check each row for straightness.Do not walk on your prepared sand. Stand on the pavings you have already installed and work your way out. Don’t get too close to the edge of the paving you’ve installed, or you might disturb the sand in front of them. You’ll almost invariably need to cut some paving to fit the edges. Don’t try to curve your paving to fit the edging. Instead, lay all the whole paving you can in each row and then go back and cut paving to the correct sizes to fit the edge. Use a masonry saw or a guillotine-style splitter to make good, clean cuts. If you gave yourself plenty of paving to work with in the beginning, you should have more than enough materials to accommodate even a few mistakes! Once all the paving are installed, run the plate compactor over them at least three times to ensure they are snuggly pressed into the sand.Be sure to use a protective covering over your plate compactor when you compress the paving in order to avoid scuffing. Fill the joints between paving with coarse sand like you used earlier, or use slightly finer sand. Pour it onto the paving and sweep it into the cracks until they are completely filled. This sand “locks” the paving in place. Make sure the sand is dry. If there is a manhole cover it must be set in place by using a mixture of sand and cement making sure it is as the correct height and fall. The manhole lid must be placed inside the outer frame to stop anyone from falling down the manhole.